The POTUS will be under constant fire, and fiercer by the day, for the rest of his difficult term. 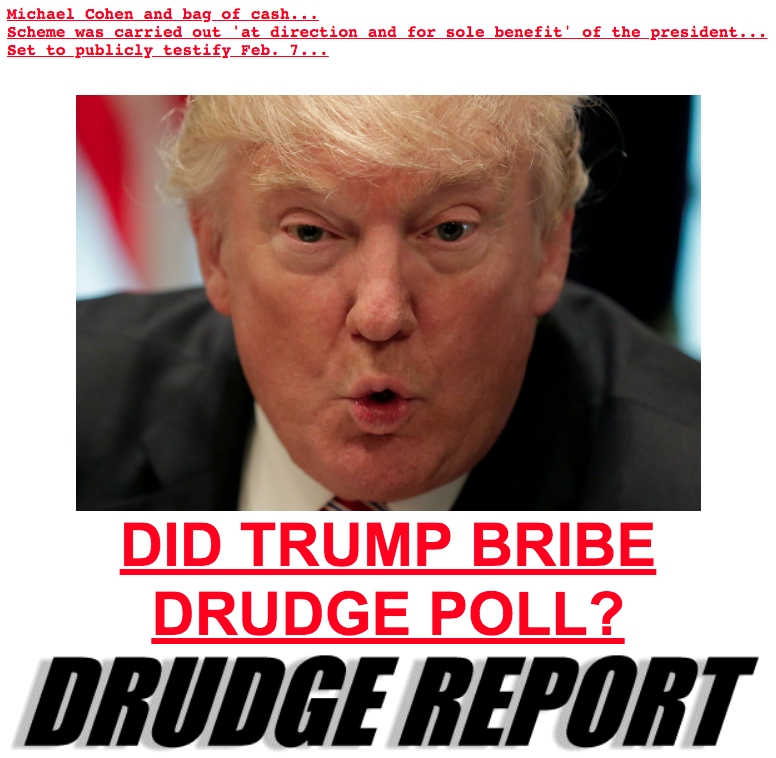 As the screenshot below from the Drudge Report illustrates, it’s gonna get real ugly inside the Beltway. that’s a snitch who was your personal attorney for many years. Once Mueller destroyed the attorney-client relationship by raiding Michael Cohen’s home and business, he was destined to be turned by the prosecutors. Once that happened, anything goes. Cohen was always the target of Special Counsel Mueller because every special counsel knows that the personal attorney has all the goods on any subject of such a far-reaching and contrived investigation. Mueller et al. knew there was no collusion between Trump and Russia. They just used the Special Counsel appointment to justify tearing through EVERY SINGLE ASPECT OF TRUMP’S LIFE AND BUSINESS. This is why the Special Counsel must be shutdown post-haste. The critical point here is that things are only going to go from bad to worse for Trump. Either he knocks down Deep State by releasing the FISAgate docs … or he’s toast. Mueller’s hitmen will take him down with one new investigation after another, and each one can produce a potential indictment after he’s a private citizen again. Cohen was put into a no win situation by Mueller—the extremely dirty cop and corrupt Special Counsel. He knows exactly what he’s going to do over the next 2 years and it will ONLY get very bad indeed for Trump. With this understanding, Cohen will be looking to escape from the federal prison in Otisville, New York any way he can. Mueller knows that and will twist the screw at every turn. Cohen failed to realize that Trump could not overtly help him while he was under investigation. Even the appearance of tampering with a witness would have exposed Trump to more potential charges from Mueller. Cohen really feels that Trump threw him under the bus, but this is incorrect. 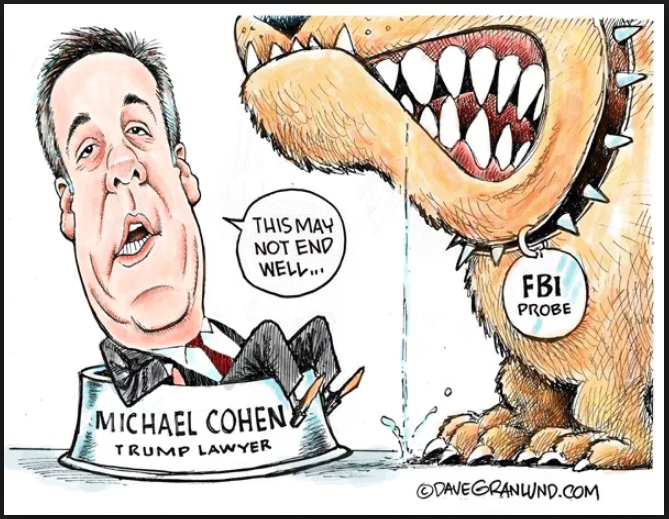 Why would Trump ever make such a foolish move knowing that Cohen has all the goods that Mueller wants. Because of Cohen’s misperceptions, he now bears a HUGE grudge against his former employer. Perhaps this was inevitable given Cohen’s feeling of betrayal which is really misperceived. Nevertheless, this hapless predicament poses the single greatest threat to Trump. In point of fact, Trump must terminate the Special Counsel investigation or risk being impeached by the House and convicted by the Senate. Yes, given what Cohen was actually privy to, as well as the degree to which he will bear false witness to save himself, the President is now exceedingly vulnerable to both state and federal prosecutions when his term expires. KEY POINT: The central pillar of Deep State is the CIA-controlled Mockingbird Media. The Jeff Bezos-owned Washington Post is one of the primary MSM organs of propaganda that just published the headline: “Democrats demand investigation after report that Trump ordered Michael Cohen to lie to Congress”. This unrelenting gaslighting of the President and nation will continue until Deep State’s soft coup is successful … … … or until Deep State has been knocked down. None of this is good news for Trump. However, every dark cloud has a silver lining. In this case, the only way that Trump will set about the process of draining the swamp is to be forced to drain it. Only by facing truly existential threats will he act as he promised to. By the way, the same could be said about any other person on the planet in this exact predicament. Who else could have weathered the tempestuous storms that he has since the very day he declared his candidacy?! after he takes his wrecking ball to Deep State. The big picture perspective for the patriots and nationalists to understand is this: regardless of what Trump really did or did not do throughout his life, he was put into the Oval Office as a divine Change Agent. Toward that end, the Higher Power will use both his strengths and weakness to accomplish the many necessary objectives. The main objectives are to prevent the further erosion of American sovereignty and territorial integrity. Hence, before the Republic can be properly restored, the swamp must be drained. Now President Trump has NO CHOICE but to pull the plug. And let the swamp monsters scurry and scamper in all directions toward their respective prison cells and gallows. It has never been so important to understand The President’s Precarious Predicament, and that he is Under Constant Attack by Enemies of the Republic. One of the most dangerous enemies of the United States of America is well described here—CROWNGATE: THE GREATEST CRIMINAL CONSPIRACY IN U.S. HISTORY.